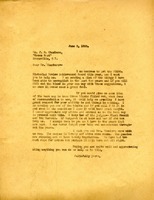 Martha writes to Mr. Chambers asking for help in filling out the blanks for the Pictorial Review Award. 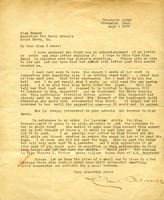 Armes discusses an order for lavender, the condition of Miss Berry's sister and a letter from Miss Berry just received. 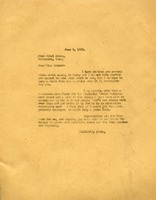 She asks for a copy of the record of Miss Berry's work that she authored. Armes inquires about why Frances Turner's lavender order has not been filled as promised. She expresses disappointment at not having seen or heard from Martha Berry during her visit north and sends congratulations for the Pictorial Review Achievement Award. 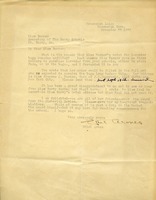 Alston writes in response to a letter from George Foster Peabody, supplying names and addresses of several prospective donors. 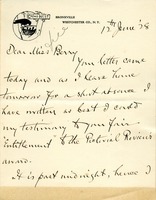 He also encourages Berry to resubmit her application for the Pictorial Review award. Marguerite tells Mrs. Hammond that she will use Mrs. Rodgers' account of the Pilgrimage to Berry for the forward. 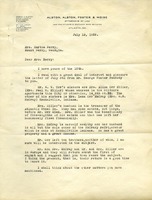 Also, Marguerite recommends that Mrs. Hammond propose Martha Berry for the Pictorial Review Award for 1926.